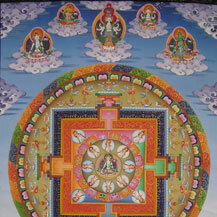 Restoration of this somewhat older Tibetan thangka of the mandala of Chenrezig (in Sanskrit called Avalokiteshvara), the Buddha of compassion. A small part of this big and beautiful Nepalese-Tibetan thangka needed some restoration and improvement on a few points in order to be correct according to tradition. 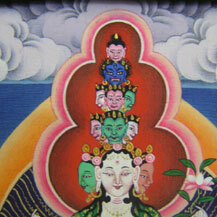 Carmen gently removed the parts that needed to be changed and painted in again, all in the same style and colors as the rest of the thangka. 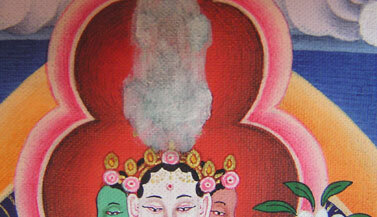 Restoration of a Nepalese thangka of the Buddha of compassion, that had suffered from severe water damage. 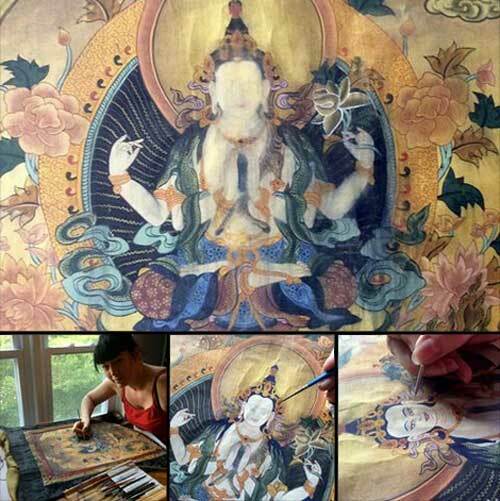 “The restoration done by Carmen Mensink of my Chenrezig Thangka was masterful especially given that the entire midsection has completely destroyed in a home flood. It takes a special kind of sensitivity and expertise to successfully match the subtle colors, delicacy of line, aesthetic details, expressiveness, and most importantly spirituality in restoring a religious artwork. Prior to undertaking the restoration, Ms. Mensink was extremely conscientious in identifying the nature, type and extent of treatment needed. As both a scholarly conservator and teacher Ms. Mensink is one of the best in her field. (I happily admit to having learned much in the process). 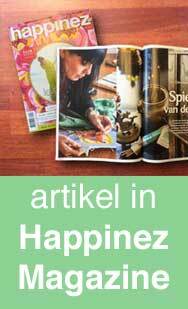 For more information or price quote send an email through the Contact Page.